In the garden as in life, sometimes simple is best. Such is the case with beans, an uncomplicated vegetable that lacks the drama of broccoli, the sizzle of peppers, the dripping fleshiness of tomatoes. Beans do have a botanic name that rolls easily on the tongue, Phaseolus, and the distinction of being one of the "three sisters" in native American horticulture, wherein long-vined pole beans were (and still are) grown in close company with squash and corn. Yet beans know many more tricks, which I re-learn each season as I guild my garden with beans. Come to think of it, I have never met a boring bean. Each year I grow several types of beans, including bush snap beans, pole beans, runner beans (a type of pole bean) and one or two varieties that produce meaty soup beans to eat in winter. Not that beans can be so neatly sorted into categories. All green beans eventually mature into soup beans, but various culinary traditions favor one stage over the other. Scarlet runner beans provide an excellent example. English gardeners treasure the tender green pods, while American gardeners grow them for their beautiful flowers. I like to cook and eat the big, meaty seeds, which is rarely done anywhere except in Central America, the homeland of the species. There is some gray area regarding the growth habit of beans, too. Many vigorous bush type varieties of soup bean produce twining stems that twist into a tangle atop the plants if not given a few stakes to keep them heading skyward. In comparison, last year I grew some bush type filet beans that were petite enough to grow in window boxes. Over the years I have grown twenty or more beans, and I will never end my quest to find ways to grow better beans. I’ve distilled my knowledge into the list of tips below, so that even the newest gardener can enjoy success with this easy crop. Wait for warmth before planting beans. Beans are uncompromising in the need for warm conditions, above 55°F (13°C), especially during germination and early growth. Weather that is too cool leads to rotting seeds, slow growth and the inability to bounce back from other problems. Never soak bean seeds in water. Soaking peas and many other vegetable seeds in water for a few hours hastens germination, but it has the opposite effect with beans. Under low oxygen conditions, bean seeds cannot proceed with germination. When planting beans in hot, dry soil, plant them in slightly recessed trenches covered with boards to keep them moist until they sprout. Plant beans where you want them to grow. Beans can be transplanted if handled very carefully, but many small roots are invariably broken in the process. Beans much prefer direct sowing. Scarlet runner beans are a notable exception, in that young seedlings can be transplanted with ease, perhaps because runner beans are perennials at heart. 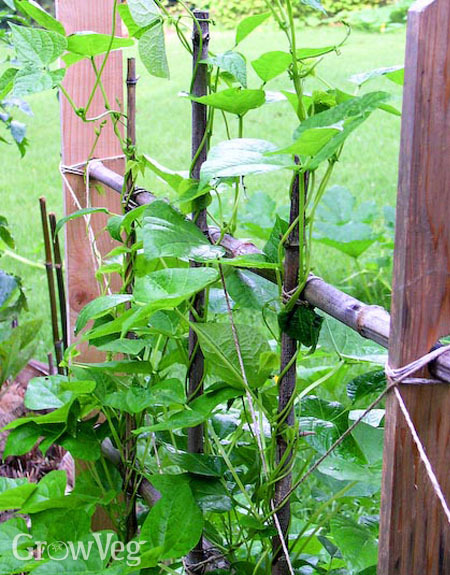 Pole beans and runner beans also need some type of trellis, as covered in Supports for Climbing Peas and Beans. Include some purples in your patch. If you plan to freeze your garden-grown snap beans, include a few purple beans in your collection. All snap beans must be blanched in boiling water or steam before they are frozen, and purple snap beans turn green at exactly the right time, like natural blanch-o-meters. Be patient during heat waves. It may seem unusual that warm-natured beans suffer from extreme heat, but they do. Frequently the plants keep growing fine through hot spell, but the blossoms drop off instead of producing beans. For this reason, gardeners in hot climates often grow bush beans in spring and fall, avoiding problems due to temperatures far outside their preferred range. Save some seeds. Bean varieties are overwhelmingly open pollinated, so you can save seeds from year to year for replanting. The best way to do this with snap beans is to grow two or three plants specifically for seed-saving purposes. With dry beans, simply select the biggest, prettiest beans from the jar for your seed beans. "Great article, Barbara, but I was hoping you would put in a paragraph about pests. I've replanted bush beans twice now and something is eating them shortly after they come up. Although I don't like using it, I've tried Sevin and still no luck. Any thoughts?" "I have the same problem as Gary. I live in Eastern North Carolina, and raise bushy healthy plants that succumb to insects that riddle the leaves with holes about the time they are starting to blossom. I have treated them each year with Neem but to no avail. My wife has concluded we should just give up. We live on 5 acres surrounded by farmland frequently planted in soybeans that are very productive but also heavily spread with pesticides which I don't consider an option. " "I have found spraying my veggies with soapy water works on most pests. I use any kind that does NOT have the antibacterial in it. Dove dish soap is my favorite. Spray the plant down really good, top and bottom of leaves. Then about an hour later I spray the plant down with plain water. Soap left on the leaves can damage the leaves in the hot sun. The soap washed off the plants also goes into the soil and puts those pests to rest also. This also works well with my house plants. Hope this helps you. Works for me." "Hey Dan, slugs seem to be a problem in my area and makes holes in the leaves. I can't say that my soapy water works very well with them because I can't seem to catch them in the act. Only see the slime trail left behind. I have to set traps for them and I hand pick them and drop them into the soapy water or salt water. I have a small garden though. Slug bait helps a little too. Maybe somebody else will comment who has a larger area to cover. Good luck." "Its Pincher bugs. The only way to get rid of them is with in ground traps and long hrs at night squishing them. " "Can you recommend the best way to mitigate damage as a result of the Mexican bean beetle? both organic and inorganic recommendations would be appreciated." "My family likes fresh green bush beans. I typically plant them in rows on May 31st, Memorial Day weekend Near Boston MA. However, the beans come to maturity just when the family goes on vacation. I finally figured out that I could plant the beans two weeks later, in June so that the crop will come in when we get back from vacation. I also plant a few rows in August and get another crop in the late Fall. The second planting doesn't give me as much as the summer crop and I always worry about an early frost. I cover them with sliced plastic garbage bags for the cold nights. I'll try the other types you mention in your article just for the variety and fun of it. " "In spring, cutworms that live in the soil can mow down bean seedlings overnight. You can get some protection by poking toothpicks or nails into the soil alongside the new sprout, which makes it impossible for cutworms to encircle the stem. When slugs become problematic, I remove any mulch and hand pick those I can. Because bush beans grow close to the ground, they may be more subject to ground-dwelling pests compared to bush beans. Switching to pole or runner beans may provide some natural pest protection because of the plants' height." "Ken, Mexican bean beetles are hard to manage once they gain a foothold. Hand pick every adult you can find, and patrol leaf undersides for clusters of yellow eggs. Also plant an abundance of flowers to attract beneficial wasps. Persistence is key to managing this pest." "Thanks, Barbara. I manage a 12,000 sq. ft. garden for the local food pantry. Last year, we had quite an infestation of bean beetles and Colorado potato beetles. I will plant a variety of flowers to help attract beneficials." "Ken, in a garden that large you might consider buying pediobius wasps (called pedio wasps), very tiny beneficial wasps that will give good control of both beetles. In small gardens they simply fly away, but they make good workers in larger ones." "card board tube from toilet paper roll cut about 2 inches and placed around the young seedling may help Gary." "Hey Faith, for slugs and snails try diluting ammonia with water 50/50. You can put this in a spray bottle and spray them directly. The solution then turns to nitrogen when it reaches the soil and doesn't harm the plants." "I have found that interplanting my beans with marigolds has completely eliminated any problems I had with mexican bean beatles." "Thanks Debbie for the ammonia recipe for slugs. Can I spray directly on the plants and not worry about burning them? I usually find them in the center of stems of my rhubarb and on the plants themselves. " "Yes, you can spray the plants directly.No harm done." "Faith, If you spray it on the rhubarb you may need to hose it off cause the slugs and snails turn green and foam up." "That is so funny. Is that called going green? It's definately worth trying. Thanks for responding. :-D"
"Is your garden fenced in with small woven wire? A Rabbit will eat a whole row of beans in one night! It might be slugs or snails, too. I have read to use blood meal to discourage rabbits, but it can attract pests like rats. There are repellants you can use, but prevention is the best. I use 1/4 inch square woven wire: 18" below ground and 18" above. A determined rabbit may still try to tunnel under, but like as not will move on to easier meals. When you put your wire down, make an L shape under the ground with another wire about 12" wide away from the garden like this: Garden |_ "
"Norm hit the nail on the head with regards to my bean eating pest. It's rabbits! I have to put up a 2 foot fence of chicken wire around my garden til the seedlings are well grown or the rabbits will clean me out. Cut worms may get a few but rabbits will take the whole row. " "Hi, can you please tell me what kind of bean that is in your 2nd picture (bottom centre)? The black spotty ones. Thank you very much, Ruben"
"The black and white beans go by several names. I call them yin-yang beans, but I've seen then called orca beans and calypso beans, too. They are among the most dependable and productive shell beans I have ever grown." "I live in Ontario Canada. Last year we had a severe drought. The dutch brown beans, which are usually a dependable bean, barely survived. The Yin Yang beans however had a good crop without any watering. Apparently that drought tolerance is one of their strong feature. I suppose you could eat the green pods but I grow them for dried beans and they are delicious. " "Hi, thanks so much for the quick reply. Sorry i think we are not talking about the same ones. I mean the black and pink/purple ones. In the second picture in the bottom centre. Thank you. Ruben"
"Ah, those are seeds of scarlet runner beans. We Americans enjoy the flowers and eat the mature beans, but in the UK they are most often eaten as green beans." "Thats great !! Thank you very much !! I look forward to planting them next season." "I'm excited to discover this page. I want to to thank you for ones time due to this fantastic read!! I definitely appreciated every bit of it and i also have you book-marked to see new stuff on your blog." "I find Neem oil is good for controlling pests and it also attracts the good bugs..I use it on all my veggies." "All our runner beans are sliced neatly off at the stem 2 inches above the ground. Whodunnit?" "Deer. Unless they were just seedlings, in which case it could be cutworms. They would leave the top lying on the ground. The last suspect, rabbits, leave a very neat slice and eat what they take, but beans are not their favorite food. To deer, beans are candy."